Expert panel explores strategies for bringing people together and along. IoT is propelling us from an era of information scarcity to an age of information abundance, but for this information to be valuable, businesses must respond to what it indicates. The reasons are varied. Responding to new information often requires a change in mindset of the entire organization. Adapting to data happens best in workplaces where employees are empowered to change the way they work and encouraged to share their knowledge across the organization. And that doesn’t always come naturally to people, whether they work in the C-suite or on the plant floor. Trent Salvaggio of the IoT Talent Consortium (left) moderated a wide-ranging panel discussion on how to equip one’s people and organizations for the digital age. Other participants, shown here enjoying a lighter moment in the discussion, included Marie Getsug of Jacobs Engineering, Hicham Wazni of Arconic, and Magyar Khosravi of Canvass Analytics. But there are experts out there—guides in leading organizational transformations through the perils and pitfalls. 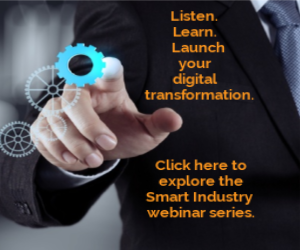 And they gathered during the Smart Industry 2018 panel titled “Organizational transformation in an age of information abundance,” where moderator Trent Salvaggio, executive director of the IoT Talent Consortium, began by posing a seemingly simple question to the professionals joining him onstage: Have you seen any major changes driven by the amount of access we now have to information? The answers, you’d think, would be a unanimous, resounding YES! But the panelists had some surprising replies. She noted the growing chasm between this massive amount of data and the human brain’s capacity for processing all of it. Without the right structure, she warned, we panic. We drown in the information we’ve worked so hard to generate. And that process (whether you label it evolution or transformation) ideally involves wisely, securely partnering IT and OT components of the enterprise (a sentiment that was repeated throughout this conference) and bringing in the pros—the data scientistsaccording to Arconic’s Hicham Wazni, who rounded out the panel. “The key is getting them to fit in with your culture,” the corporate director of manufacturing intelligence & smart manufacturing added. That requires change, of course. New methods. New mindsets about getting down to work. The panelist shared their perspectives on training teams to properly adopt and implement these practices. Wazni detailed a complete, three-tiered approach in which every level of an organization is trained for their level of responsibilities. “We create a matrix of courses that each position needs to be successful in the smart-manufacturing space,” he said, detailing the top layer of leaders, and middle and lower layers of implementers. "That goal is having management that is inspired rather than fearful. When you have the ability to learn, that fuels the culture." “And it’s gone perfectly, right?” asked Salvaggio, generating laughs from the audience. That humorous question opened the discussion on the common unwillingness to make changes that are advised by all of this new data—how actionable insights can overcome industrial inertia. Even with the right motivation, the correct strategy and the proper training, smart-manufacturing efforts fail at an alarming rate. The panel was asked why that remains a reality. And the best way to accomplish those things is education. From experts. Like the foursome on this Smart Industry panel.